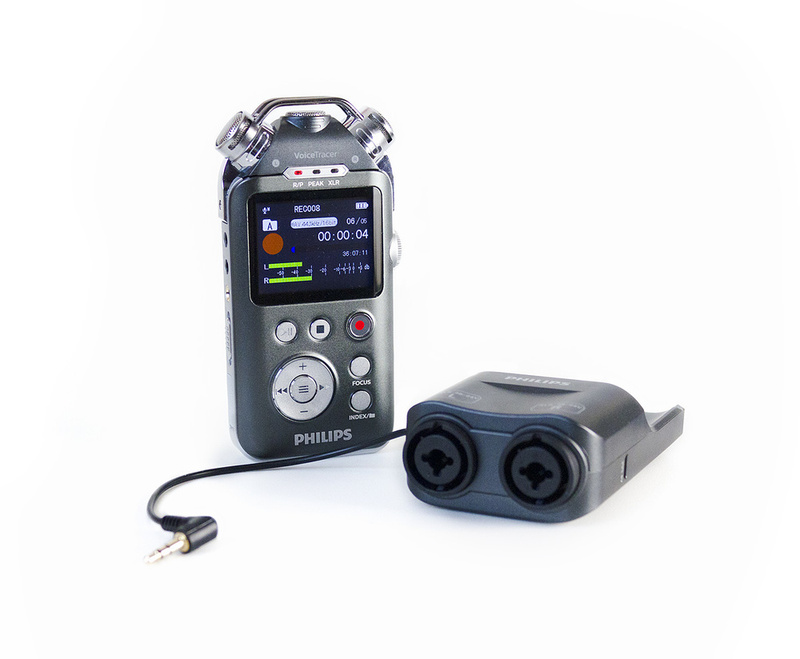 The Philips VoiceTracer range of products covers a lot of ground, from simple voice recorders right up to the DVT7500. 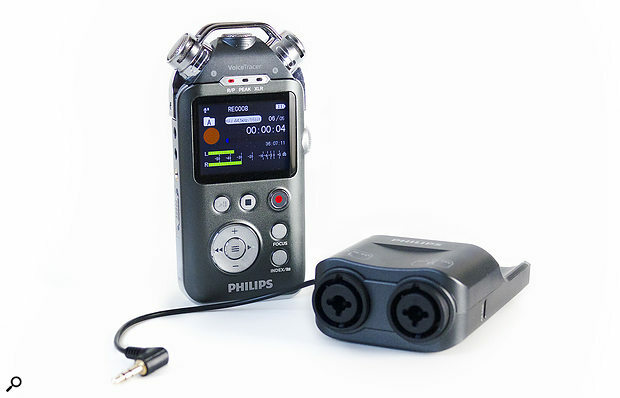 While this model does offer dictaphone functionality, it actually has far more in common with pro-quality PCM recorders from the likes of Zoom, Tascam and Olympus. An integral, 1300mAh lithium-ion battery provides up to 25 hours of operation, with a full charge via the USB port taking three hours. The USB connection is also used to transfer files or load firmware updates. One unusual feature is the included docking XLR adaptor ‘pod’, which houses two XLR/jack ‘combi’ inputs for mic or line-level recording. A side-panel mini-jack accepts the dock’s captive cable, and two thumbscrews hold the recorder firmly in the dock. The XLR dock contains active electronics, so it needs to be charged separately from the recorder, again via the included USB cable. A slide-switch on the side of the dock allows 24 or 48 Volt phantom power to be applied to the XLRs. The backlit screen uses colour where appropriate but isn’t unnecessarily flashy. This displays recording details, menu navigation and metering. Most navigation tasks are accomplished using the four-way cursor ring and its centre button, though there are also dedicated buttons for various key functions, including Record, Focus, Index, Delete and Play/Pause/Stop. Digital noise reduction is activated via another side-mounted slide-switch, and there are additional buttons for changing the playback speed or entering delete mode. A set of three mini-jacks on the left-hand side accepts the XLR pod feed, an external mic and headphones. A small in-built speaker allows the recordings to be auditioned, but headphones can, of course, be plugged in, and when that’s done the speaker is muted. 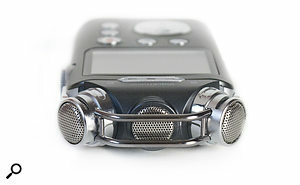 The VoiceTracer DVT7500 has three onboard mics, the outer two being directional and the centre one omni.As with some of the competition, the VoiceTracer DVT7500 has three onboard mics, the outer two being directional and the centre one omni, facilitating the more effective capture of low frequencies. Numerous record modes cover eight different mic and line input permutations, including combinations of the on-board mics, the mini-jack mic and inputs from the XLR dock. While the manual calls this Multichannel mode, all the sources are still mixed and recorded as a stereo file. Input gain is set using the Focus button while the machine is in record-pause mode, using the small dial on the side of the body. This works the opposite way than I’d anticipated, with maximum gain being at the fully anti-clockwise position. If the internal limiter is active, the mic sensitivity is automatically reduced when the signal level gets too hot. A low-cut filter can roll off unwanted low-frequency sounds such as traffic rumble, and some basic post-recording editing functions allow files to be appended, split, trimmed or to have new sections inserted. Such tasks are more easily performed in a software DAW, but these functions could still prove useful on occasion. The technical spec of the machine is impressive for the asking price, as is the use of a high-quality Wolfson D-A converter. The signal-to-noise ratio is 116dB, the response is flat to within ±0.1 dB from 20Hz to 20kHz, and there’s a THD figure of just 0.005 percent — the audio performance rivals that of many pieces of pro studio equipment. A ClearVoice feature can be turned on, and this adjusts the level of quiet passages dynamically, to improve intelligibility when using the machine as a dictaphone. It’s not isomething you’d normally use for music, but I suppose it could come in handy if you were using it as a ‘scratchpad’ for song lyric ideas. And for ‘off duty’ time, a music player mode supports MP3, WMA, WAV, AAC, FLAC, APE, OGG and M4A file formats. While you can now easily record to your smartphone, you still need to locate and then start up the appropriate app, whereas the VoiceTracer offers one-touch recording — when this mode is active, pressing and holding the Record button both switches the VoiceTracer on and starts recording. There are also timer- and voice-activated record modes, so you can ensure that no recording time is wasted on silences. For the latter, recording stops three seconds after the input falls silent and resumes when new sounds are detected, with an adjustable threshold helping to prevent accidental triggering. For recording, PCM files are supported up to 24-bit/96kHz resolution. Curiously, 24-bit recording is only available at the 96kHz sample rate; all other sample rates are limited to 16-bit resolution. I‘d have preferred a 24-bit/44.1 or 48 kHz option, which would save considerable storage space/upload time and so on, while still offering the dynamic range of 24-bit recording, but it’s not a major issue. You can also record direct to MP3, which allows the on-board 16GB memory to hold up to 270 hours of material (using the 128kbps MP3 setting). Should you need more memory, a slot at the side of the machine accommodates a Micro SD card. Note, however, that only 128kbps MP3 recordings can be saved to the external memory card — PCM recordings must be made using the internal storage. Recordings are organised in a familiar folder-based file structure, with each of four folders able to store up to 99 recordings. When a folder becomes full, subsequent recordings are sent to the next available folder. Index marks can be added during a recording, with up to 32 index marks for each audio file. Recordings may be transferred to Mac OS, Windows or Linux machines via the USB 2 connection — the VoiceTracer shows up on the computer as a standard external hard drive. Once the battery is charged, you must set the date and time, so that the time at which recordings are made is correctly identified. Potentially a very useful feature is that if the battery goes flat during recording, you won’t lose what you’ve already recorded. 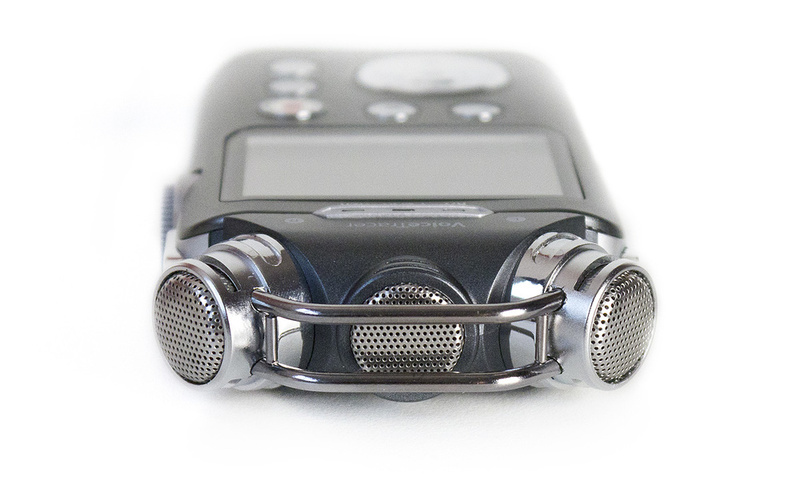 A quick read through the manual helps you get up to speed, but those who prefer to ‘dive in’ should be happy enough, as most aspects of the operation are fairly intuitive — unless, that is, you need to explore the more arcane dictaphone features. The quality of recording via the on-board mics is excellent; the VoiceTracer DVT7500 produces clean and very natural-sounding results. But the option of being able to use your own studio mics via the XLR dock and to mix them with the on-board mics is very welcome indeed. I managed to make some sweet-sounding guitar-amp recordings using two studio mics facing the amp and the built-in mics facing the other way, to pick up some room sound. While many of the features aimed towards dictation won’t be used for serious music recording, the limiter is useful for intercepting unexpected peaks; unless abused, this sounds pretty transparent. On a practical level, I loved the colour display, and transferring files to a computer was drag-and-drop simple. So, the technical specs and subjective sound quality are good, and the operation intuitive — there’s very little to dislike. The decision to make 24-bit recording available only at the highest sample rate is a trifle odd, as is the inability to use the memory card for PCM recordings — perhaps these can be addressed via firmware updates in the future? But in all other respects, this is a very versatile and user-friendly machine. If you don’t need the XLR mic option, then competing models offer similar sound quality and functionality at a slightly lower cost and some are physically smaller, but overall the VoiceTracer DVT7500 is a good choice for recording location sounds or musical ideas that you may later want to import into a serious project. While there are now plenty of 24-bit portable digital recorders, there are fewer that offer XLR inputs and phantom power. For that, you could consider models by Zoom, Tascam and Olympus. Included XLR Adaptor dock with phantom power. 24-bit recording only available at 96kHz sampling rate. SD card only supports MP3 recordings. This high-quality and feature-rich portable recorder has the added benefit of the XLR Adaptor dock, which should appeal to music makers, and it doubles up as a high-quality dictaphone.